Hockey Pucked: Our Next Treasurer As Clueless As Goose? 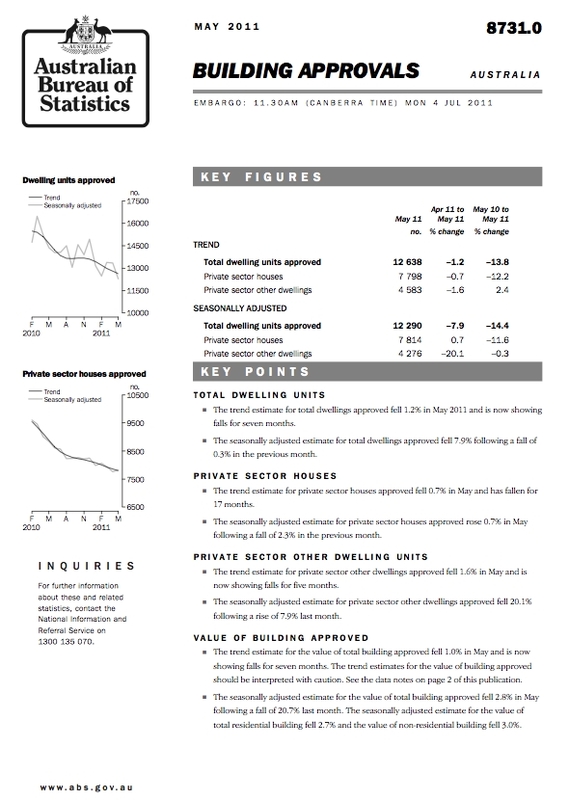 The latest building approvals data came out a few days ago. Australian residential building approvals fell 7.9 per cent to 12,290 units in May, seasonally adjusted. This compares to a downwardly revised 13,342 units in April. In the year to May, building approvals were down 14.4 per cent, the Australian Bureau of Statistics (ABS) said on Monday. Economists’ forecasts had centred on a 0.5 per cent fall in approvals in May. The economists’ “forecasts” were not worth the binary code they are “printed” with. And they were wrong … on the “too confident” side. Could it be that these unnamed “economists”, whose forecast for a tiny fall was (yet again) so far off beam … are connected to the banking industry … which lives and breathes off its lending hundreds of billions into our now-bursting, debt-driven, housing bubble Ponzi scheme? And could it be that our next Treasurer – the Liberal Party’s Joe Hockey – is just as clueless as the dribbling imbecile currently in the job? Building approvals down for 7th month in a row. NSW and Vict. hardest hit.I can’t believe house prices won’t rise soon on back of shortages. Joe has drunk the Kool-aid (as they say in North America). He’s drunk the sweet sugary orange Cottee’s cordial, in other words. He’s bought into the great “housing shortage” myth. You know. The one that every other country with a housing bubble fervently believed in too. The myth that has been comprehensively debunked here in Australia, by Money Morning amongst others. One can only wonder what Joe would make of the following advertisement, that was brought to my attention by Twitter user @iClevercat. 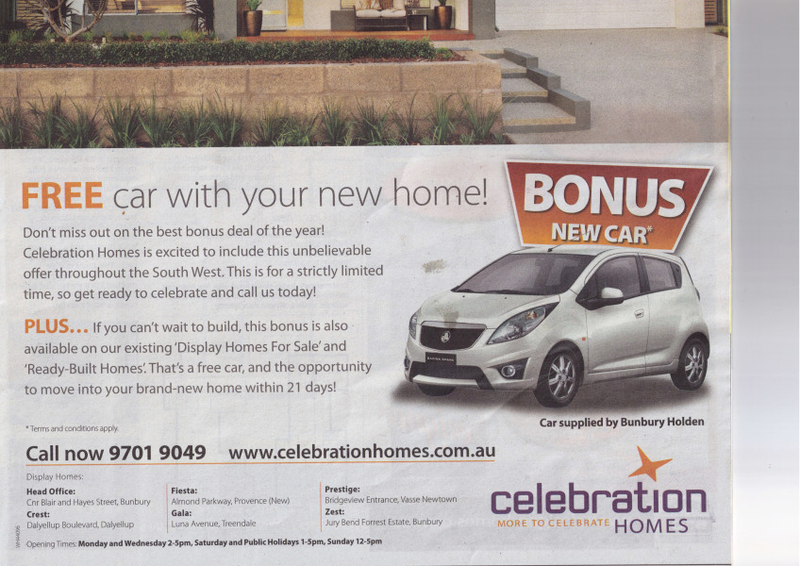 The advertisement was in a magazine insert included with the weekend edition of a major West Australian newspaper. Placed by a major home builder, in our only economic “boom” state. 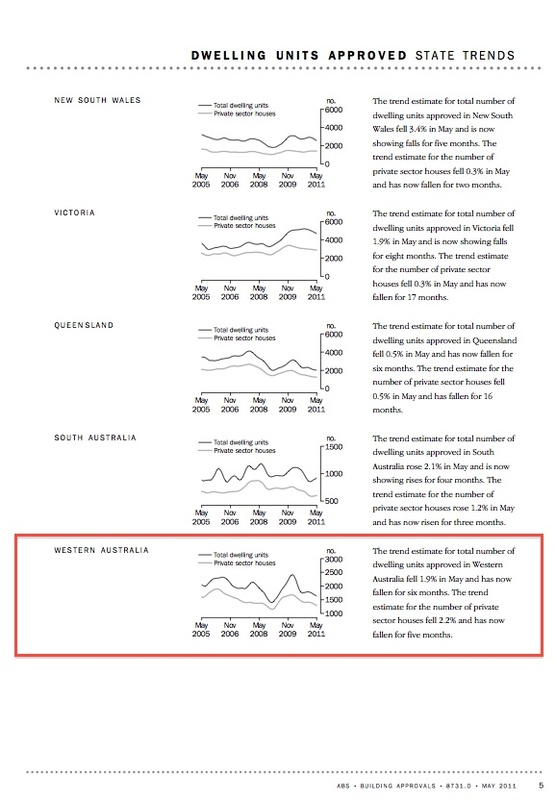 Now, what’s the ABS data say about the trend for building approvals (ie, demand for new houses) in our last remaining economic nirvana, Western Australia? 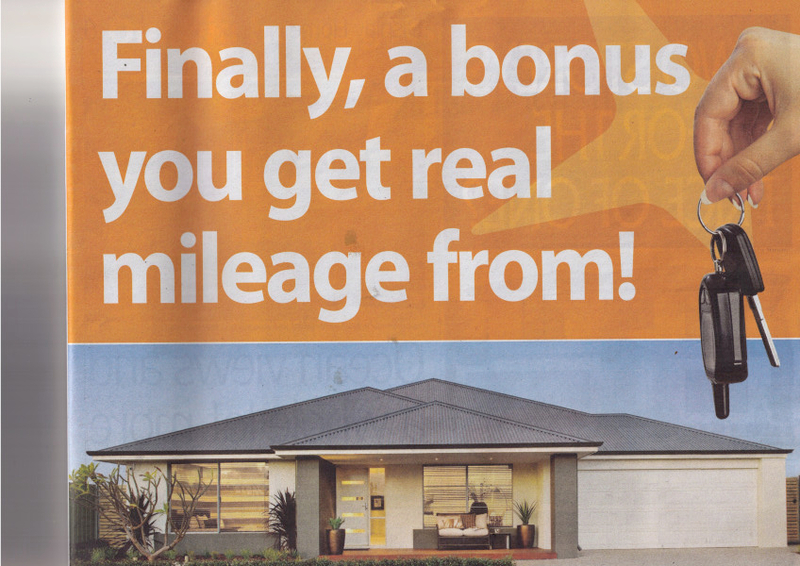 And major builders in that same “boom” state are offering a $14,500 RRP “free” car, as an incentive to encourage people to sign up for a new house. 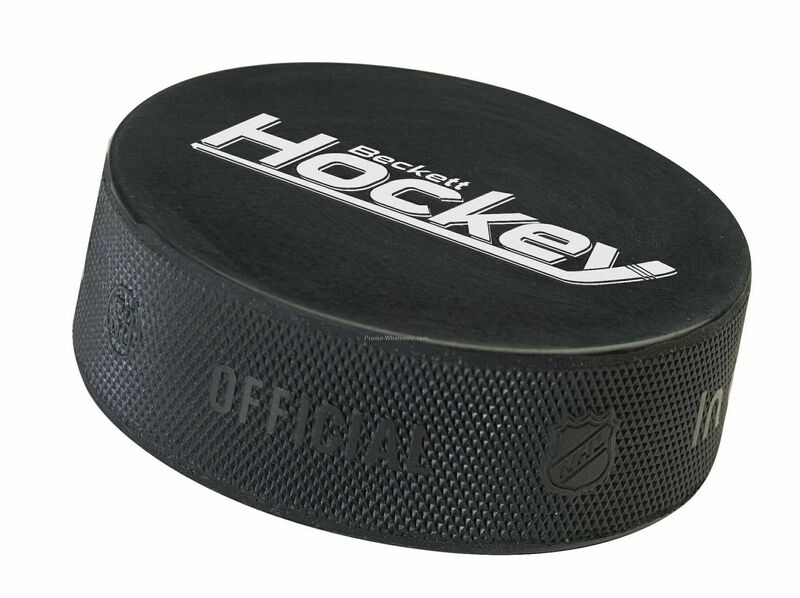 What say you, Mr Hockey? Or must we conclude that our economic fate is to be handed over from the Goose to another babbling buffoon who’s dense as puck. Hockey is a fat, slovenly p***k who knows nothing about economics, though he seems to know a lot about eating & sitting on his arse. Good point about WA, that’s something I’ve pointed out on macrobusiness.com, if there really is a mining boom there shouldn’t be any problems with the housing market. Look at the share prices of many of the miners on the ASX, going nowhere. Mining boom just doesn’t gel with me.